Hope you enjoyed the episode today, and found something valuable that you can use and apply in your own life. Levi: How are you doing? Reid: Good. Good. I got back from a farm visit today. I went and met with a hops farmer. He’s got a big harvesting machine that he got from Germany at his barn. We talked about compost and he’s very friendly. It was a good visit. We both learned some things. Levi: Yeah. I’ve heard some talk about those harvesters and how they’re hard to get and very expensive but everyone wants them. Reid: Yeah. And sort of the trick is that you, I guess, come up with one that’s mobile. But the biggest problem is that everyone wants crops harvested at the exact same time. So you would need one that is big enough to operate very, very quickly and in large volumes but small enough to still be mobile and fit on a truck. Reid: Because otherwise you’re just left with every farmer to either having a neighbor who has one or have one themselves. Levi: Right. Like one machine for every two hops farm of something. I guess I’m glad that I don’t have to worry about solving that problem. Reid: Yeah. Unless you want to get into growing hops. Levi: Not really right at the moment. I mean I might grow some just for fun. Just a few pines but I don’t think I’m going to go crazy with it. How’s the new pad? Reid: Good. Good. I am sitting in one of our three bedrooms. This is supposed to end up being the craft room, I guess. It’s just weird having this much space. A little while ago, I was playing with (our dog Foetus) and at the living room floor which was also interesting because we have a big living room now. But I got my workshop space set up in the basement and I can just leave my projects out. It’s pretty awesome. Levi: That sounds very nice. Right about now, we don’t even have enough room in here to exercise and do yoga or anything. Levi: Well, I can do some stretches but not like– if we both (me and Brenda) wanted to do a full on sequence or something, there’s just not the room. But I can stretch around and stuff. Reid: The celling was so low in our apartment that I could not do mountain poses. Reid: I had to turn my wrists over because the ceiling was that low. Reid: I used to be able to make Sonder walk on the ceiling and now I can’t. Levi: I bet she misses that. Reid: Well, I just get to throw her around more. Levi: Yeah, there’s more room for baby flight. Cool. Do you mind starting out by explaining what is Interotten? Reid: I think the best way to describe Interotten (actually it just came to me in recent conversation) is Interotten was a CSC. Like a CSA (Community Supported Agriculture) this was Community Supported Compost. It functions almost in a very similar way where you would have memberships. Community members will sign up for a membership and then they would get compost service. Once a week, we would show up by bicycle with a clean 5 gallon bucket and pick up the full 5 gallon bucket, take it, make a compost and then get that compost delivered back out to our members. The name Interotten came from another local business. Interotten was located in Interlochen, Michigan which is the home of the Interlochen center for the Arts. Down the street from us was a fiber arts store called Interquilten. We just kind of went with that theme of punning the name of the village. I guess there is also another– the mini golf course next door to us was Locken Wood so there is already this culture of punning the name of the village. It was a bicycle powered compost business. It was a local business (sole proprietorship) that was run very much like a community organization. Even though we were a privately-owned for profit venture, we still had a mission statement. The mission statement was to support the soil, support the community and to support my daughter. That’s where the private local business comes into play. But that resonated with everybody in the village where it was like, ‘here’s a hardworking family working to serve the community and to have this local business that provides for the community and by doing so (literally providing for the fertile soil of the community) that in turn provided for my child, as well as for the children and the future of the community as a whole. It was very well received. It was able to grow quickly and helpfully. Reid: Is that a good answer to your question? Levi: Yeah. That gives a good picture. Maybe so we can get an idea (like a scale), how many folks were doing the pick-ups, how many buckets did you pick-up per week or per day? Reid: When I first started, I had a two-kid burley trailer (a kid haul or bike trailer). If I was pretty creative with my stacking, I could fit about six full 5 gallon buckets. The first Saturday that I went out knocking on doors and attempting to get people to sign up for this service. I got six people to sign up and I only had six buckets so once I signed up six people and I had given them their buckets, then I needed to stop because I didn’t have a bucket to give the next person. In a week, I had to find six more buckets so that I could give those people clean buckets and take their buckets. So the following Saturday (by that point I had six more buckets) I went and swapped out their buckets and dumped the food waste, mixed it with leaves, cleaned the buckets and then went right back out and signed up six more people and gave away those buckets. So that’s where it became my goal. It was that every week I was going to sign up six more people. That was a little bit fast and so we slowed down. The other thing that was going on was that Saturdays were the pick-up day but that was also the best day to catch people at home and have the conversation to hopefully sign them up. Saturdays became very busy very quickly. I could not get enough buckets fast enough so at one point I would pick up half the route, dump and clean their buckets, go out, swap those buckets for the other half, dump and clean those buckets and then take those buckets back to the first people I picked up from all in one day. I just didn’t have enough buckets to take enough clean ones. That was something I learned very quickly. It was that in the system I was using, I needed twice as many buckets as I had members. But peak membership that first year because we started in the spring. I think we started in early May. In peak summer (June, July, August) we had the Interlochen Center for the Arts which was our biggest account. I’ll give more detail about that in a minute. The restaurant across, the local library and about 20-25 or so residential membership (households). We were charging $10 per month for weekly pick up and we had to iron out some things so that was– I didn’t really have the membership tacked down. It was certainly, ‘here’s your pick up day’ and you’ll get a clean bucket and we’ll pick up once a week then you’ll pay us at the beginning of every month and service will continue.’ But it wasn’t really drawn out specifically how much compost they would get back. I wasn’t really sure yet how much compost I was going to be able to produce. I wanted to be able to sell the compost for profit as well. So I had to figure out how much compost my members really should get back and how much compost should I be able to sell to bring in more income for business and keep the business afloat and keep membership rates down. There was one member who was starting a garden and they were on top of a sandy hill and they had a large for compost and I just was overly generous and said, ‘here is 5 buckets of compost right off the bat. No problem’ and realized quickly that that was going to be a little much. So later on, it came out to a membership was a weekly pick up and one free 5 gallon bucket of compost every spring and you get a discount if you bought more than that from us at the farmer’s market. We started selling compost at the farmer’s market. Levi: Gotcha. Okay, so you had to balance a few things and figure out how to make it all work. Reid: There was a lot of trouble shooting and a lot of ironing out there (various problems that came out) like realizing that we needed twice as many buckets as members. Levi: At this time where you’re still using that little kiddie trailer? Reid: When Interlochen Center for the Arts became a customer, we had to scale up. Levi: Which is a school? Reid: Yeah. When I very first started, I had this idea to do the 5 gallon bucket operation which wasn’t a new thing. There was another door to door bicycle powered operation is Traverse city nearby called Carter’s Compost which was spearheaded by a young boy. I think he started when he was 7 and his dad helped him make that business. We modeled a lot of what we did after that. The 5 gallon bucket bicycle deal that was very much a part of them. But there was another organization in the area called BARC which is Bay Area Recycling for Charity and they did a larger trash bin compost service. It was not bicycle powered that served the more commercial need. So we had a couple 20 gallon trash bins that we were working to develop a business plan so you can have the residential plan with the 5 gallon bucket or if you were a business, you can do this larger bin. The price difference. It became very clear very quickly that the 5 gallon bucket operation was far more profitable and the buckets became more available and we had a really good source of those. The larger bins were expensive and cumbersome so we quickly phased that out. Right about the time that we were realizing that the 5 gallon bucket thing made a lot of sense for us, especially with the bikes, was the same time that we were sort of courting Interlochen Center for the Arts for their business. I had originally offered them a large trash bin plan and then later said, ‘Sorry, we’re not going to do that. I can offer you the residential plan and you could pay by bucket.’ So what that turned out to is that instead of paying by month, we divided that $10 monthly down into the 4 buckets that would get picked up for a month, which came out to $2.50 per bucket. So I would just keep Interlochen Center for the Arts stocked with clean buckets and every week or as many times a week as I needed to, I would go and pick up the buckets that they had that were full and keep track and then build them. That’s $2.50 for every bucket. I sort of pitched that deal saying, ‘This is so expensive. They’re not going to do this’ and they went for it. I originally offered that 8 buckets a week, I think. Then they said, ‘Well, can we do 8 buckets a day?’ I was looking at my trailer and I paused and I was like, ‘Yes.’ So I called up Carter’s Compost because I knew that they had various larger trailers and I said, ‘What’s your favorite trailer and how do I get one?’ and they ended up having one that they didn’t really need any more that could easily carry 12 buckets. I later realized that I could haul about 19 or 20 full 5 gallon buckets with this trailer. They said, ‘You can buy it from us.’ They let me buy it in installments which is really great because a lot of entrepreneurs hit this wall where they have this opportunity to take on a large account but they don’t have the capital or the infrastructure to process the needs of that large account. They don’t have the money upfront for the capital or infrastructure that they require in order to get the money that they need. So it’s kind of a puzzle. You’re stuck. So Carter’s Compost, by letting me pay off the trailer ($100 a month at a time rather than $900 in total all at once) I was able to use the trailer to make the money to pay off the trailer and continue to grow the business. In peak summer, I was picking up from just one of the 3 cafeterias at the Center for the Arts and that was coming out to be about 40 buckets a week. So that was 2 trips with the trailer and that was a good chunk a change. Levi: Cool. So besides BARC and Carter’s Compost, are there other operations, maybe around the country, that you’ve heard of that inspired you or helped mentor you as you start to create this? Reid: Now, I’m aware of 14 bicycle powered compost companies across the country. 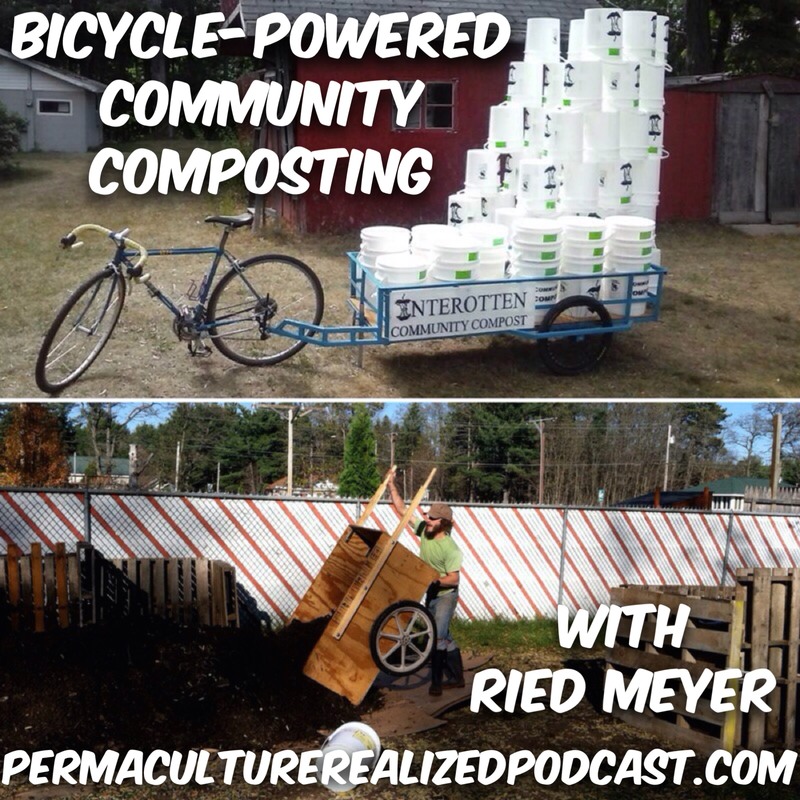 There’s a Facebook group called bicycle-powered compost collaboration. It is a closed group so you have to ask in order to be incorporated but most of the companies have some sort of representation in that Facebook group. So if someone is interested in starting a business or has a bicycle-powered compost business and would like to network with people who are troubleshooting all of those problems and working to grow that specific type of business or community organization, that’s a resource. Also, you can certainly contact me on Facebook Reid Stewart Waring Meyer and I can help direct you into that network and link you up with those people. You can also google some of the company, some of the more prominent ones. Of course, Carter’s Compost in Traverse City, Bootstrap Compost is a bicycle-powered compost operation in Boston. Gainesville Compost (obviously in Gainesville, Florida) and Compost Peddlers, which I believe is in Austin, Texas, and that may be the biggest as far as number of members and may be the most profitable. They have a business staff and they have a bicycle fleet and they’ve got quite a network. This is not a new idea. I modeled my business after Carter’s Compost and then realized that that was not an operation that was made to bring in the amount of money to support a family. It was sort of a good thing for a father and son to do for educational and activity purposes. So the pricing is something that you need to pay attention to. We were charging $10 a month. The memberships, more or less, are pretty much the same. Weekly pick-up, one or two 5 gallon buckets of compost in return. There are different point systems and some other creative ideas that other companies have come up with for their memberships but that’s sort of the basic model. The next most affordable in the country is doing it for like 14. Bootstrap, I believe (the last time I checked), is doing it for $32 dollars a month. I think Gainesville is 20 or 24. So if you are thinking about starting, certainly look at the price. Ours, I will admit, $10 a month was not enough to really have a strong, profitable margin to grow and support a family. Levi: Gotcha. So you talk a lot about the pick-up side of things. How about the composting side? First of all, how much space did you have to do it? How far away was it from the houses and the places you are picking it up and then how did you actually run that space or get it started? Reid:First off, the lay out of the village was optimal for this type of operation. We had a dense community of households within a mile radius. Also within a mile radius, we had a bank, a post office, a public library, a school and a farmer’s market and the Interlochen Center for the Arts. So we had one big account, a bunch of residences, there was a place where a community garden is in the planning stage. So lots of potential, all very, very dense and all very flat. There was one hill and that was uphill to the Interlochen Center for the Arts and downhill coming back. So empty buckets up, full buckets down. Logistically it all worked very well. Our location was right in the middle of all of this and we had a partnership with an apartment/cabin complex owner so there was a mutual agreement to serve the tenants and seasonal visitors for the apartment and cabin’s place with compost service, in exchange for being allowed to conduct a composting there on our property. That’s sort of a unique set up but most bicycle powered compost operations have some sort of partnership as far conducting the compost. We did every single aspect of the business. We did pick-ups, we did the composting, we did the distribution, we did the marketing, and we did everything. Other companies partner with a farm (perhaps an urban or a community garden or a farm on the outskirts of town or the village) and just do the haul and sort of trade the compost to the farmer for the service of the farmer tending to the compost and then giving the bicycle hauling company back the compost required to meet the meet the needs of the members. So be creative about the structure and if you’re in a village that has community open space, then that can be (inaudible) to do the composting. Odor can be an issue so you have to be good at composting. We had a miniature golf course right next to where we were conducting our compost and if we let buckets sit out in the sun while we did our route then that evening or late afternoon, pop those buckets open and started mixing compost or decided to turn an active compost pile and the wind was taking the odor over to the golf course for people who were eating ice cream cones and playing mini golf, then we had a complaint there. That’s something to be conscious of. Also, if you have to be totally on top of your composting operation and use the appropriate ratios of carbon material so that your odor doesn’t get out of hand. Levi: What was the carbon material that you were using? Reid: We mixed kitchen scraps that we got from our clients with leaves that we– provided a leaf dump in the haul where we stockpile all of the leaves that we would need for the whole year. So it was leaves and kitchen scraps. The ratio that we were using was one bucket of kitchen scraps to two buckets of leaves. We paid attention to whether or not folks were throwing paper and egg cartons in their buckets and whether their buckets are half full. A more appropriate ratio would certainly be one bucket of kitchen scrap to three buckets of leaves (if you’re using leaves). The more carbon, the safer. We were producing very hot, active batches that needed to be tended and turned very often requiring a lot of labor but produce compost very, very quickly. Levi: And the food scraps that you are getting from the customers, those are mostly nitrogen. They’re higher in nitrogen, right? Reid: Yeah. Fruit typically is the exact carbon-nitrogen ratio that you want for a compost. The reason that you can’t just have a pile of fruit is because fruits are very juicy so you have a moisture issue. Vegetables tend to be higher in nitrogen than carbon so if you have a lot of vegetables, then you need to be adding some sort of carbon. Leaves have a higher carbon than nitrogen ratio than is optimal for compost. But you can compost just leaves. If you shred just leaves and turn then, you will get leaf mold and it’ll snow like a good old leaf pile and it’ll heat and you’ll have compost. But if you had a little bit of puffy grounds or a little bit of food scraps, it’ll heat up more vigorously and you’ll have a quicker, hotter compost pile than with just leaves. So it’s sort of finding the balance in there. There is certainly an art to it. Levi: And how are you turning the pile? Reid: I was turning the pile with a tool cold the compost crank produced by LOTECH products. I believe that’s handmade by a family in Arizona. It’s an auger style compost turning tool. First off, our compost piles were in pallet boxes so four pallets wrapped together at the corners with home electrician wire (kind of a giant twist ice) and then we would stand on top of the pile, screw this auger tool down into the compost and then pull up. It was very strenuous, very hard on your back if you didn’t do it just right. So we used the combination of that tool and turning the pile with a manure fork, physically removing it the adjacent bin. We had very many bins. We had (I think) over 20 going at one time that were active. So you would go on your route, you come home, you mix the kitchen scraps with the appropriate ratio of leaves, you let it sit for a couple of days and just in that couple of days you would see a heat up upwards of 100 degrees Fahrenheit and you would see the volume reduced almost by 3/4. Sometimes even 50 percent. A lot of that is settling of material and reduction of air space but also a lot of it is structural decomposition. Levi: Interesting. So for someone that was just getting started, if you were to do it again what type of a system would you recommend? Reid: If I were to start a bicycle-powered compost operation right now, I would seriously look for someone else to do the physical composting. If I were to do it myself, I would choose a composting technique that was far less labor-intensive. Now, if you choose a composting method that was less labor-intensive, that means you’re going to have a slower rate of decomposition because you’re going to need to assemble either statically aerated piles or choose a carbon ratio that is higher meaning more carbon so more leaves. Your temperature is going to be lower which is going to mean that this material is going to stay around longer and break down over a longer period of time so you’re going to have to have a larger area to conduct your composting. Levi: Do you have any other advice or thoughts for folks who might be interested in starting this type of a compost service? Reid: I would go visit a couple of other existing operations before you start and contact some people who have been doing bicycle-powered compost as a successful business for a few years and really do your research ahead of time. I sort of just went into it and figured stuff out on my own as I went. So if I were to start one now, already knowing what I learned, I would research my area. I would look for partners who might be able to conduct certain parts of the business. I would find my trailers. I would survey the neighborhood and maybe see who would be interested in such a service. Make a pamphlet. Make a YouTube video. Direct some people to some bicycle-powered operations that are already going on and say, ‘Hey, would you be interested in a service?’ Then you can have a map of not only customers you think might be interested but customers who have told you that they’re interested. Then you can pick your territory and say this is where we’re going to conduct pickups. This farmer over here is already doing compost and would gladly accept more food scraps. Maybe they already have leaves there. Plan how you’re going to get leaves ahead of time. I was sort of lucky in my first because I started in spring. I had a customer who had a lawn care business and had leaves stock piled in his own yard that his wife was eager for him to get rid of. So he dropped off three dump trailer loads of leaves through me for free in spring which was great. I realized that fall that I needed to find a way to stock pile all the leaves that I would need for the whole following year, not knowing how much business I was going to end up doing the following year. So coming up with the business plan ahead of time, I think would be the best thing and doing as much research and learning as much as you can ahead of time from people who have been doing it. The Facebook group is a good resource for that. There are compost forums and conferences and all sorts of things. Levi: Well, one thing I’m curious about is what got you into this whole thing? What is your backstory that took you into that avenue? Reid: Biking has always been part of my family. After traveling around the country after college, I did a project where I rode my bike around the state of Michigan. The project was called Gift Cycle. I rode my bike around the state pulling that small trailer that I ended up starting Interotten with. I would dumpster dive and pull out all of the things that people were throwing away that were still good. We’re talking toys and coolers and stuff was even new, just had damaged packaging. Picnic baskets. Grocery stores throwing away food that is certainly still perfectly good and that is totally legal to be donated to food pantries but just wasn’t because of distribution problems. I would take the stuff and clean it and then give it away to people for free who could use and then I Facebooked about it. You can actually still go to the Gift Cycle Facebook page which is facebook.com/giftcyclemi. If you scroll all the way to the bottom, you’ll get through all the junk and you can see when the page began. That’s where the pictures in the blog and the list of things go. That was the project that primed me very much to have this bicycle-powered compost business because the hauling and the logistics and the meeting people and being face-to-face, those were all skills that were a big part of it. Compost is always been a part of the way that I grew up and the programs that I participated in school and various places I lived leading to this point in my life. There was certainly a lot about the art of composting that I learned during this business and preparing for this business. I got a lot of books from the library, I did a lot of reading, I did a lot of my own composting and I tried a lot of different things. So right before starting Interotten, I worked at a company, an organization called SEEDS as an education specialist where I taught wilderness living skills with an afterschool program. My daughter, who is now a year and a half old, has some medical complications and that winter that I was teaching there was a couple times that I would bring home illnesses that I would catch at work being in the schools and then she would get them, too, because she was medically fragile. We would end up at the hospital. Actually, that winter we spent 53 days in the hospital and she ended up getting a tracheostomy tube which requires a lot of energy and time from us as parents and I had to leave that job because I no longer had the availability in my schedule. So I had to leave that job. I was at home and unemployed and needed to come up with something to do to bring in some income. All the pieces in the puzzle kind of fell into place. We were in this small community. I had learned Carter’s Compost in Traverse City nearby. I met with them and figured I can do that. I just went for it. That’s kind of where I landed at. the second half of that, which is where we come from since, I think given better circumstances and maybe if we hadn’t had a kid and we’re in the same situation, we would have more time to iron out the pitfalls that we came across and deal with the problems that arose and maybe have another job on the side. We would have been to continue. But the pricing was an issue. I needed to raise prices. I had just created a plan to raise our prices and shift things around as far as our membership benefits. We were attempting to do year round but didn’t quite have the partnership with the snow plowing ironed out appropriately so we weren’t getting plowed out which contributed to us having to cancel service for the winter. We had gotten our bike and had our winter plan, we had our winter clothes, we had our– how to clean buckets without a hose. We had a lot of things figured out. I think second or third winter we could have done it. That was kind of a huge hit. I shifted my game in an attempt to better serve the composting needs of the Interlochen Center for the Arts by coming up with a proposal for them to develop and in-house composting system. This would involve a large composting machine, which is essentially a large vessel that’s insulated and contains the compost pile, keeps all the heat in, protects it, keeps it from critters from getting into it. It helps manage the smell, you load sawdust or leaves and kitchen scraps in one end and then a week later out comes the black, fluffy hot compost that you then store and let it finish. I had this proposal and it’s kind of moving away from the bike riding and more into consulting with the information about composting that I learned. I was hoping to maybe get a position at the Interlochen Center for the Arts managing this composting and implementing that system for them, in hopes of being more supported and continuing with the community projects and the community compost business and scale it back a little bit. Maybe work towards the community garden project, that sort of thing. Around that time, there was another job offer at the table further south and my parents were further south and the hospital that my daughter depended so much on was further south. So we ended up making the difficult decision to move away from the area. So that’s when we closed the Interotten (bicycle-powered compost business). Now, I’m the market coordinator for the third largest composting facility in the State, which is just an astronomical shift in scale. Now, instead of selling a bucket of compost, we sell dump trucks full of compost. Instead of turning the compost pile by hand, a 15 foot high wind rouge gets turned by a very large loader (a giant piece of machinery). Essentially, it’s very different. It is totally different but I’m working to make it serve the people in the same way just on a different scale and working very hard to strengthen the biodegradable recycling system at a large scale. It’s a new world, it’s a different approach but I would certainly love to help to start and develop bicycle powered compost companies if people are interested in doing that. There’s certainly a potential of doing that where I am by having larger companies support us more. For example, one idea is to have– if there’s a company that does compost pick up or food scrap pick up at the scale of a dumpster and a truck, then the neighborhood can come together to get a dumpster. Then the bikes can go and collect the buckets from the households and dump the buckets into the dumpster. You can have a company that runs the bikes and the buckets and charge the membership for the bucket pickup and pays for the dumpster. If you adjust those price margin right then they can be a profitable business that runs in that segment of the grand recycling system. My company, for example, now we don’t do the pickup. We just do the composting. So it’s the garbage companies that are picking up the yard ways and picking up the food scraps with their garbage trucks and bringing it into our facility. They pay us to be able to dump the biodegradable material. We turn it into compost and then we sell it. So already you can see how these larger companies are outsourcing various parts of the operation. So if you’re thinking about doing a bicycle-powered operation, don’t think that you have to do it all. You can get away with running a business just offering the hauling by bicycle or you can just be the composter if you know someone who has a bike and a trailer, for example. You can be just the farmer. Heck, you can be the bucket washing guy. Levi: If you really wanted to. Reid: And just rent out clean buckets and charge for a bucket cleaning service. If you have the friends who are willing to do the other aspects of the business and participate in the cycle. There is many different ways to fit yourself into supporting the communities’ biodegradable recycling system. Levi: Nice. Cool. Do you have any last thoughts before we bring this to a close? Reid: I think that the country, as a whole, is headed into a system that recycles everything. Partly because of the ideals that are coming with the generation that’s taking over the decision making roles in our society, partly because of culture. But also partly because we don’t really have another choice. Landfills are filling up. Garbage prices are going to be going up. They kind of came down with the oil bubble that we saw but before that, they were going up. Landfills were getting full. Landfills are becoming subject to tighter and tighter restrictions so in order to afford the structure to comply with those restrictions and in order to afford the ability to start a landfill in a new area because all of the places that are suitable for landfill that have the appropriate drainage and clay and retention and those geological sites, they’re not making any more sites. They’re not making any more new places. So for example, the city of Grand Rapids here within the next decade will most likely be proving municipal compost service so the market is there. In Michigan, it’s already illegal to throw yard ways into the landfill. So right there, that is a mandated market for anybody who is turning yard ways into compost. It’s required by law that anyone disposing of yard ways go find somebody who has a business composting that sort of thing. Manhattan, I believe, just passed a mandated composting but the municipality doesn’t have the infrastructure to handle itself so again, it’s sort of putting pressure on the private sector and entrepreneurs, like us, to rise to the occasion and to figure out how to process this material. So looking at it from a business perspective, it’s a great opportunity. Looking at it from a community basis, we should have been doing this a long time ago and it’s a marvelous thing for a community. It fits very much in line with the ideas of community libraries and community gardens and community farmer’s markets and community backyard gardens. One of things that I did with my business was I gave all of my members a garlic planting kit, which was kind of a scheme to get all of my members gardening in their backyards. Because if they’re all gardening in their backyards, then they need compost. So it was a contagious community culture pusher. An attitude change and my business was participating in it. This is something that I feel that is very much coming down the line. So if you are someone who feels strongly about bicycling or composting or gardening or food production or community action or farmer’s market. This is something to pay attention to and this is a conversation that we need to be having because it’s happening. That’s sort of where my focus is and that’s where a lot of my interest is as far as compost goes and business goes. I’d be more than willing to network with anybody who is interested and even sit down and help some people who want to do a bicycle-powered business. I’d be happy to be a resource. Levi: Awesome! Cool. Thanks for sharing your story and knowledge today. It was really good talking to you. I’ll be in touch. I hope the best for you and your family.